Please refer to our stock # 3203 when inquiring. 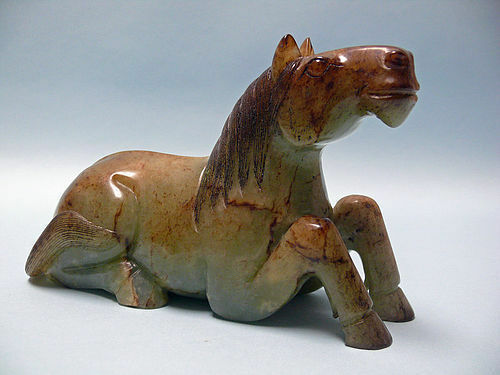 Exquisite Ming Dynasty (1368 – 1644) Jade Horse in a recumbent position, head turned and ears pointed. Carved in jade of sea-green hue incorporating russet and brown tones and it measures 4 1/2" x 7 1/4" x 3 1/4". Intact and in excellent condition. Ex: R. Swetits collection, New Jersey. Finely carved mane and the face has a serene and confident expression communicated through the crisply-defined mouth, nostrils and eyes. A group of similar horses was exhibited in 1975 at the Victoria and Albert Museum. According to Andrew Marlborough, an expert from Duke's auctioneers said there has been a great deal of interest in these beautiful objects not only because of the astonishing workmanship but also because of the subject. In 2014 a Ming jade horse exceeded estimates of £20,000-£30,000 when it sold for £170,000 at Mallams in Cheltenham.